The goal of this activity is to share the life of the saint so that the youth might relate to what this saint has done and maybe look to the saint as a role model. 1st - 5th Grades - Complete 4 requirements and 2 of the activities. 6th - 12th Grades - Complete 5 requirements and 3 of the activities. Where and when was St. George born? When is the feast day of this saint? St. George is considered the Patron Saint of? What is St. George known for (major accomplishment)? St. George is probably best known for the legend of St. George and the Dragon. What was this legend all about and what similarities does it have to St. George's real life? Draw a picture showing some of his actual accomplishments. Introduce others to St. George by telling the story and sharing this picture with your family and friends. Identify the next Religious Emblem of Faith that you can earn as a scout and meet with your Scout leader or family and start working on this next program. Create signs and posters that get people to ask themselves how they can be a better Christian. Place these in your school or church. Perform an examination of conscience. What would you do if you saw someone being bullied? How might you imitate St. George? After completing the requirements, the participants will order the patch online. 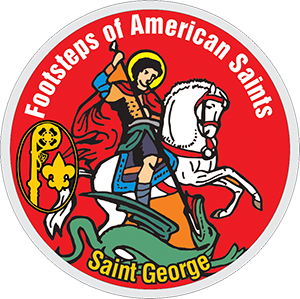 UPDATE: My Cub Scouts earned this badge by reading about Saint George from this book: The Martyrdom of Saint George of Cappadocia from Saint Shenouda Press' All Time Heroes from All Times Series. I highly recommend this book for both youth and adults! May only Roman Catholics Scouts earn this? No. Any Scout may earn any of the activity patches. The requirements are grade-specific. Is this activity considered a religious emblem and may a Scout receive a religious knot after earning this activity? No. This activity is considered a religious activity, not a religious emblem. Scouts may not receive a religious knot for earning any of the activity patches. Who may serve as an adult mentor for this activity? Any parent or adult who meets the standard BSA YPT requirements. Is there any time requirement? Only that the grade-specific requirements need to be completed while in the respective grade level. Do the answers need to be submitted? No. The answers should be reviewed by an adult. The Order Form and patch fee are the only things that need to be submitted. Who do I check with once I complete the requirements for my grade level? Any knowledgeable parent, Scout leader, Priest, Deacon, Monastic, or Catechist.